In: Information Fusion 50 Pages 112-125 Elsevier 10/2019. In: Tagungsband der Internationalen Tagung Wirtschaftsinformatik 2019. Human Practice. Digital Ecologies. Our Future. Internationale Tagung Wirtschaftsinformatik (WI-2019) February 24-27 Siegen Germany Pages 2026-2039 Universität Siegen Siegen 2/2019. In: Proceedings of AKBC 2019. 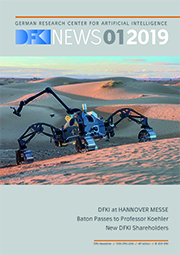 Automated Knowledge Base Construction (AKBC-2019) May 20-22 Amherst Massachusetts United States Pages 1-18 OpenReview 2019. In: Proceedings of the 2019 Conference of the North American Chapter of the Association for Computational Linguistics (NAACL-HLT): Demonstrations. Meeting of the North American Chapter of the Association for Computational Linguistics (NAACL-2019) June 2-7 Minneapolis Minnesota United States Association for Computational Linguistics 2019. In: NAACL-HLT 2019 Workshop on Evaluating Vector Space Representations for NLP (RepEval). Meeting of the North American Chapter of the Association for Computational Linguistics (NAACL) June 2-7 MInneapolis Minnesota United States Association for Computational Linguistics 2019. PhD-Thesis Universität des Saarlandes SciDok - Elektronische Dokumente der Universität des Saarlandes Saarbrücken 2019. In: Proceedings of the 17th International Workshop on Treebanks and Linguistic Theories (TLT 2018). International Workshop on Treebanks and Linguistic Theories (TLT-2018) December 13-14 Oslo Norway Linköping Electronic Conference Proceedings ISBN 978-91-7685-137-1 Linköping University Electronic Press, Linköpings universitet 12/2018. In: EMNLP-2018, System Demonstration. Conference on Emperical Methods in Natural Language Processing (EMNLP-2018) November 2-4 Brüssel Belgium EMNLP 11/2018. In: Third Conference on Machine Translation (WMT), Volume 2: Shared Task Papers. Conference on Emperical Methods in Natural Language Processing (EMNLP-2018) Third Conference on Machine Translation (WMT), Volume 2: Shared Task Papers October 31-November 4 Brussels Belgium Belgium Pages 759-764 2 Association for Computational Linguistics 10/2018. In: Proceedings of the 9th Workshop on Computational Approaches to Subjectivity, Sentiment and Social Media Analysis. Conference on Emperical Methods in Natural Language Processing (EMNLP-2018) Proceedings of the 9th Workshop on Computational Approaches to Subjectivity, Sentiment and Social Media Analysis located at EMNLP October 31-November 4 Brussels Belgium Pages 316-321 Association for Computational Linguistics 10/2018.